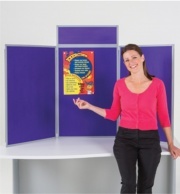 Exhibition and Display Stands: We offer a wide range of Exhibition and Folding Display Panel Systems. From simple folding Tabletop Displays which are ideal for small presentations, displays, coursework presentation, trade fairs etc through to large freestanding Pole and Panel Exhibition Displays we offer a wide variety of colours, fabrics, sizes and style combinations. We also offer a range of Display Plinths to compliment our Exhibition and Display range as well as a selection of display lighting.